You can supply your own artwork as a PDF file or e-mail a draft of what you want and we will create a professional looking form that you can check and change until you are happy. Basic forms cost around £30 to create, more complex forms cost from £45.. 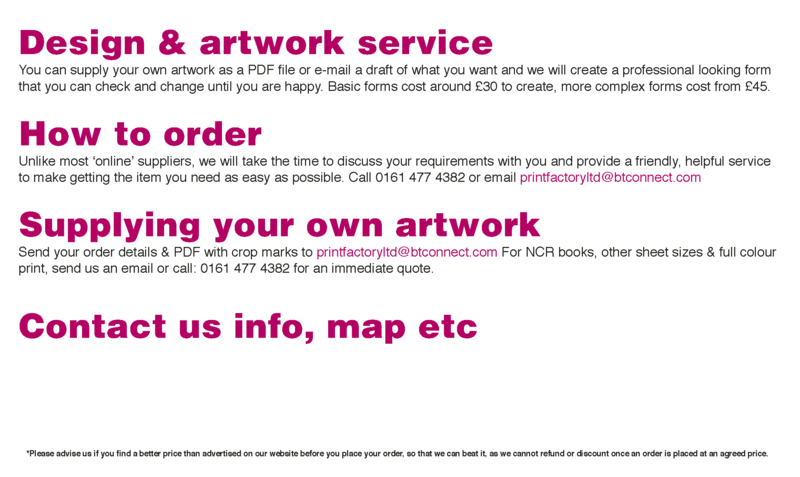 Send your order details & PDF with crop marks to printfactoryltd@btconnect.com For NCR books, other sheet sizes & full colour print, send us an email or call: 0161 477 4382 for an immediate quote. Send your order details & pdf with crop marks to printfactoryltd@btconnect.com For NCR books, other sheet sizes & full colour print send us an email or call 0161 477 4382 for an immediate quote. Please note trade prices cannot be used in conjunction with any other special offers or vouchers. Contact us using the below form or better still, call us! I agree to you contacting me using the above information. Please note that we will NEVER pass on your details to any other parties! Promise! *Please advise us if you find a better price than advertised on our website before you place your order, so that we can beat it, as we cannot refund or discount once an order is placed at an agreed price.